This post is by current #citylis student Nancy Beckett-Jones. 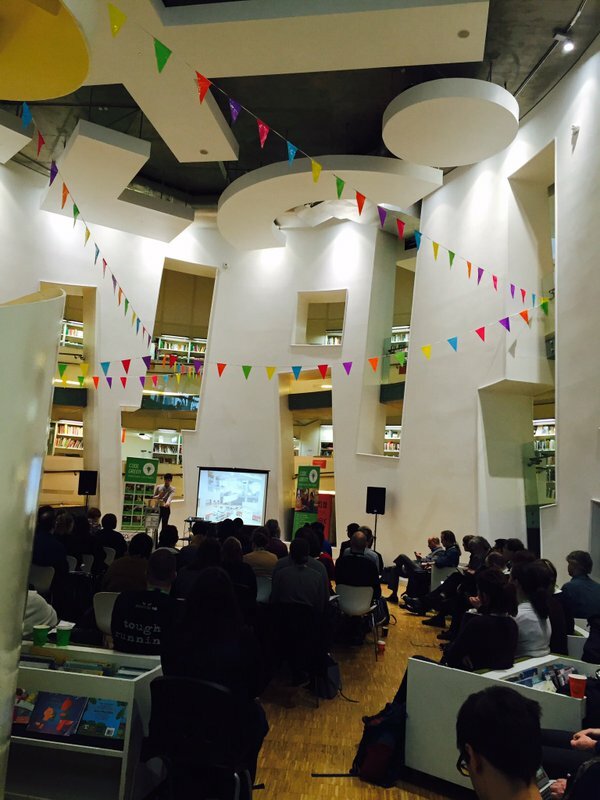 On Tuesday 1st March 2016, Clapham Library hosted the very well attended Society of Chief Librarians’ conference ‘Cracking the Code’. This day-long event sought to showcase examples of digital activities happening in public libraries; as well as to create an opportunity for LIS professionals to come together to share experiences and concerns with implementing digital activity programs. #codegreen was to be our twitter hashtag that trended that day, allowing us a space to record thoughts, promote ideas and connect with others. The tweets produced are a wonderful collection and representation of what took place. Matt Stokes on the digital divide. The morning sessions kicked off with Matt Stokes’ impassioned reminder as to why digital activities are so crucial in a public library’s programme of events. We should not overlook how they help equip young people with vital digital skills that are and will be essential. These digital activities can be linked to equality in information provision: digital making helps close the gap, bridging the digital divide. Suitably motivated and inspired, we each went to our own chosen workshop. 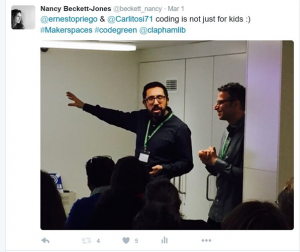 I attended the ‘Introducing Maker Spaces in Libraries’  session run by Ernesto Priego and Carlos Iszak. The session promoted practical discussion, encouraging the group to think creatively about how digital activities could be implemented in libraries. Everyone contributed with their own unique experiences. The overriding concern seemed to be how in a time of stretched resources could these new digital activities actually be set up? By discussing how some had already encountered this successfully, new channels of thinking and new ways of tackling this dilemma emerged. Ernesto urged us to be creative, asking each one of us: “What can you do?” “Who do you know?” How therefore, can we make this happen? This shared energy and enthusiasm to get things underway made the conference an exciting place to be that day; and Carlos’ Makercart seemed to be the answer. A makerspace activity that was affordable and portable, so that it could be shared by different communities. I then had the opportunity to talk a little about how #citylis students had had first- hand experience of the Makercart in our DITA module last semester. Ernesto then reminded us all that coding is not just for kids, and despite coding clubs being marketed to and for young people, we can all enjoy and benefit from this activity. That alongside the drive to foster a digitally able populace, runs the idea that creative activities, whether they be digital or otherwise, encourage community engagement. The group then went on to make and play in the second session: ‘Carlos and his Makercart and Artefacto’. Before I left I took time to explore the wonderful Clapham Library. A space that challenges the notion of, and overthrows the traditional model of the library. And it struck me how significant the choice of venue was, and how it complimented the day’s focus. The impressive helter-skelter interior and playful architecture mimicked the playful activity that it housed that day. A truly great communal venue to discuss digital inclusion through digital making I think. I came away filled with positivity about public libraries, about how in tune they were with the needs of their users, and how vital they were to communities. Nancy Beckett-Jones is on Twitter @beckett_nancy. Find out more about postgraduate study in Library and Information Science at #citylis, meet alumni, current students and staff on our next open evening on Wednesday 8 June 2016. Register here. Student Perspectives is our series of guest posts written by current #citylis students. If you are a current #citylis student or alumni and would like to contribute a post, please contact our Editor, James Atkinson. 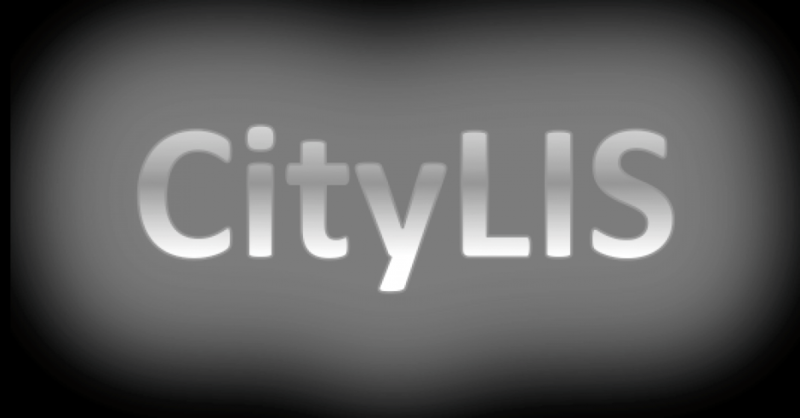 For current and future Library and Information Science news, opportunities and events follow the #citylis blog on Twitter @citylis. 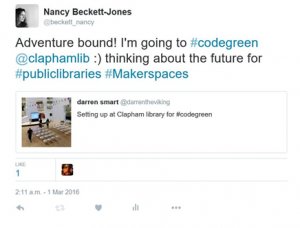 This entry was posted in Student Perspectives and tagged #codegreen, CityLIS, Clapham Library, conferences, DITA, LIS, makerspaces, Student Perspectives. Bookmark the permalink.